The World Mission Society Church of God have received an award for voluntary service from Mayor Councillor Peter Rush. 80 members of the society attended the award ceremony on 6 September at Rochdale Town Hall. 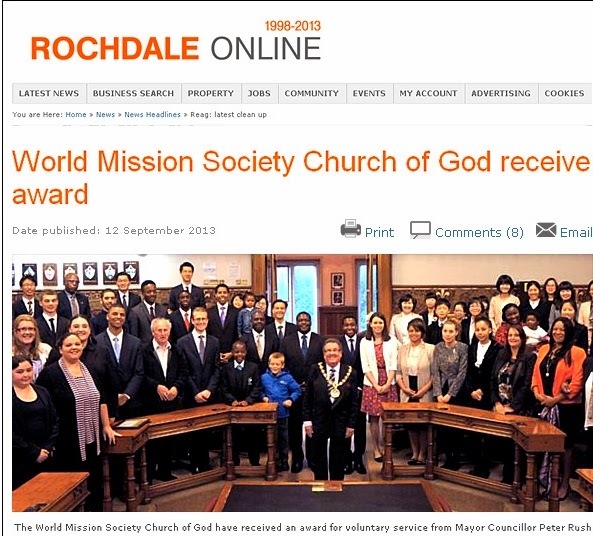 World Mission Society Church of God has been doing various volunteer work throughout Rochdale, including clean up campaigns and providing entertainment to residents in local care homes. The group also continues to support the local blood drive. Through their volunteer work, the group wants to inform people of the seriousness of environmental issues. Share the post "World Mission Society Church of God receives award"
Oh, wonderful Heavenly Father~ Oh, wonderful Heavenly Mother~ Thanks, praise and glory be only to our Elohim God! give thanks to our Elohim God who let us join the work of god for the glory of God. We can do everything for our God wholeheartedly. The wmscog has won the award for several consecutive years .